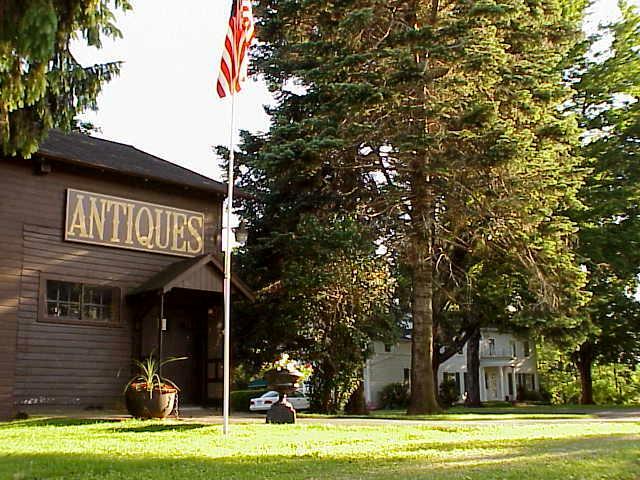 Landmark Acres Antiques is located in Westfield, New York with a special listing on the National Register of Historic Places. Since 1946 Landmark Acres has grown to be one of the larger and older quality antique shops in this part of the nation. Landmark Acres Antiques with 5000 sq. feet offers a large display of early antiques and a few decorator items (1720 to 1920). We are always interested in buying individual antiques of quality. Please visit our antique shop and we may be able to help you. We only publish a few items to our website to give you an idea of our inventory. Detailed descriptions are available on most pieces in our shop. Perhaps our antique shop inventory will be helpful in determining the value of pieces you already own. Everything is sold through our shop and in recent years, our website. Because of the internet we have been able to buy more important items from private homes farther away. We have also been able to acquire many new customers from around the country. Recently we are interested in purchasing Gold and Silver - jewelry, watches, sterling and coins. Our antique shop offers a selection of 18th, 19th and early 20th century country and formal American Furniture as well as a few European and Asian pieces (1720 to 1950). We also have art, oriental rugs, china, glass and porcelain, a large selection of silver flatware and hollowware, coins, jewelry, watches, books, paintings, a large selection of early lighting, aesthetic movement, art nouveau, arts and craft, and decorative accessories. The United States government defines an antique as being over 100 years old. Interestingly enough artistry, workmanship and use of quality materials is not discussed. All purchases require a 50% deposit and the balance paid within 30 days. Please allow time for your balance to clear before pick-up and pick-up should be scheduled in advance. 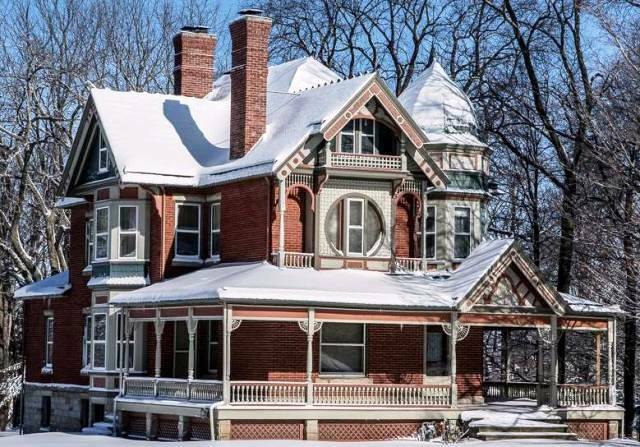 Each are National Historic Register Properties, Candlelight Lodge 1851, Captain Storm House 1892 (a famous George Barber designed home), each professionally restored and furnished with many antique pieces acquired in the last 45 years. 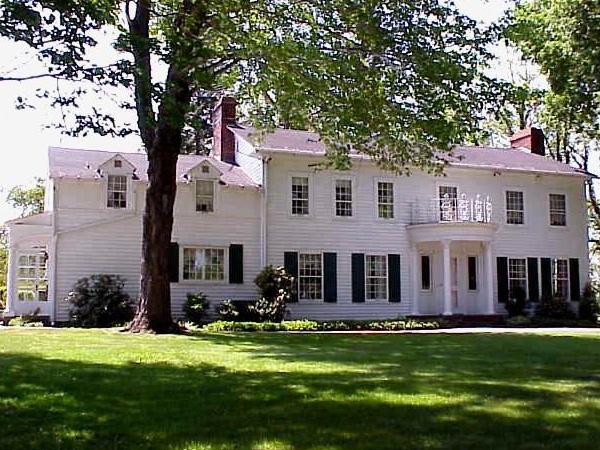 Landmark Acres (1802) our home, is also the oldest settled property in Chautauqua County and hosted the County Centennial and Bicentennial Celebrations (1902 & 2002) on our front lawn. Tiger Maple & Birdseye Dining Set, Table, 6 Chairs & Chest, PA or Ohio, C. 1825, Very Rare, old refinishing, original hardware, drop leaf table with solid fine birdseye top (rarest maple), wonderful fine cherry turned legs and brass cup castors, 6 solid Tiger Chairs w. saber legs, birdseye maple crests and newer caned seats, Table - 74"L with 25" drops up x 47" W x 30" H, table will take two additional chairs. Dom Perignon 1990 - released 1999 before Millennial Celebration 2000, lower harvest, higher quality & heavy consumption, World's best known Champaign, a classic vintage, (Parker 98 pts), Special Gift Box w. History, bottle, wire, cork $20 (empty), By the unopened gift box w. full bottle, please inquire. Unopened case also available, well stored (stone cellar) & not available elsewhere. Royal Copenhagen Blue Flowers - Braided, 5 Complete Serving Pieces C. 1950, Large Covered Tureen 7�� H x 12� W, Square Deep Dish Serving Piece (slight chip) 10�, Large Tea Pot 6 ��H x 9 ��W, Creamer & Sugar ea. 4 �� H $495. 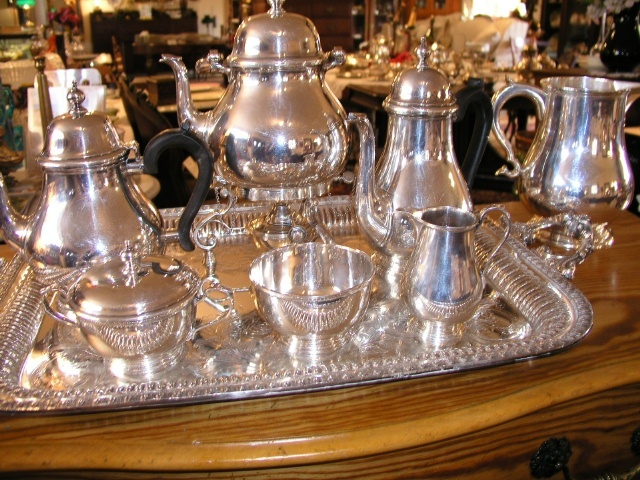 Tiffany Coffee & Tea Set, Queen Anne, 'Tiffany Makers' rare signature (designed & made in house not Tiffany & Co.), Sterling 6 Pc., Early and Heavy, 1950's, Rare Hot Water Kettle 14"H w handle (3� pts), Coffee 10"(2� pts), Tea 9"(3 pts), Sugar 4�", Creamer 4�" & Waste 2⅝", larger, heavier & more rare than recent Q. A. Sets, Monogrammed Script K, excellent condition (additional non matching tray & pitcher SOLD) 6 Pc. Set 153 oz. $7895.